My husband and I go to eat at our favorite Mexican restaurant at least a few times a month, he especially likes to go during the weekends because that’s when they actually serve their carnitas plate and tacos, which he absolutely loves. I refused to even taste them for the longest time because I had never, ever tasted great carnitas. Every recipe I tried for making “amazing” carnitas failed miserably in my opinion. I’ve made them with all kinds of “special” spices and juices like orange, lemon, lime and even pineapple but they were either too spicy, tangy or not incredible. Bottom line, I was never blown away. It wasn’t until about two years ago that I decided to try the carnitas served at this restaurant after my husband raved about them and he was absolutely right, they’re amazing. And the reason they are so delicious is because they don’t marinade them at all, they simply bake them and then pan fry them with lard before serving. And so, my quest for finding a similar recipe began until I saw Rick Bayless from the cooking show “Mexico: One Plate At A Time” make his own version and they came out amazing. I don’t follow his directions exactly to make mine because as with most recipes, I always end up doing my own thing. 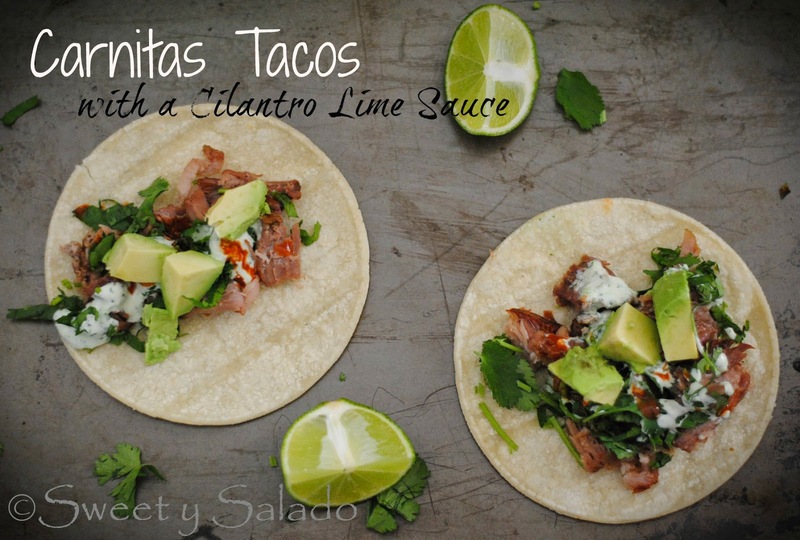 But the simplicity of the recipe served with a fantastic cilantro lime sauce is pure perfection. 1. Place the cilantro, jalapeño, garlic, onion, cumin, lime juice, cream and mayo in a food processor and blend until smooth. Add salt to taste and blend again to incorporate. This sauce can be stored in the refrigerator for up to three days. 2. Trim the fat and skin off the pork shoulder, this step is completely optional. Then, cut it in half to end up with two large pieces and remove the bone. 3. Season the meat with salt to taste and place it in a large roasting or baking dish. Bake at 375ºF (190ºC) for 1 hour. Take the pork pieces out of the oven and flip them over. Raise the oven temperature to 450ºF (232ºC) and bake them again for about 30 more minutes or until golden brown making sure to turn the meat over every 5-8 minutes. Once the meat is cooked, shred it on a cutting board and set aside. 5. Warm the corn tortillas in a hot pan for about 5-10 seconds per side. You can also fry them in a little bit of oil. Place them on a plate and cover them with a towel or paper towel. 6. 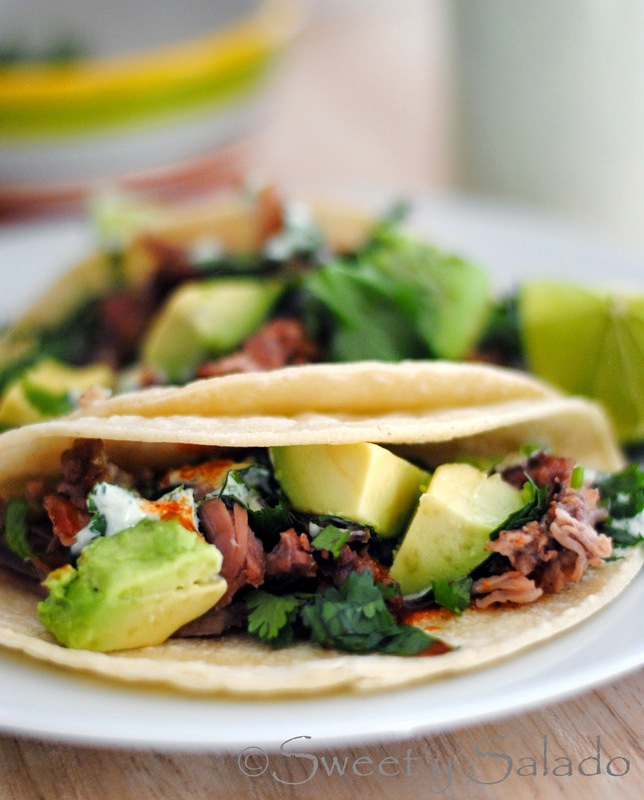 To assemble the tacos put some of the carnitas on one or two corn tortillas and garnish with the cilantro, white onion, cilantro lime sauce, hot sauce, avocado and lime wedges. Adapted from Mexico: One Plate At A Time. These look fantastic, great recipe. Love, love, love that cilantro lime sauce!! !